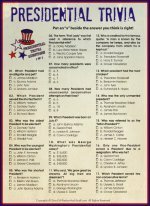 Use this Right Left Easter Game as an icebreaker when you want to randomly distribute some prizes during an Easter celebration. It's also a great way to add a twist to an Easter gift exchange. One way to play is to fill an egg or basket (one for each person) with mystery treats and pass these around during the story to determine who gets what treat. This Easter party game is based on the Bible story and is perfect for church Easter celebrations and traditional family Easter get-togethers. The story has some very sad moments, so expect the tone of your game to become quite mellow then. The good news is that the story has a very happy ending, so when the story is over, you'll have reason to celebrate. To play this Right Left Easter Game, have all participants sit in a circle and pass the gift(s), (candy, prizes, etc.) to the right when the word RIGHT is spoken and to the left when the word LEFT is spoken. The gift(s) belong to whomever is holding them when you have finished reading the story. There were only two days LEFT before the Passover the chief priests wanted to find the RIGHT way to arrest and then kill Jesus. RIGHT then, Judas Iscariot went RIGHT to the chief priests to offer to hand Jesus over to them. They were delighted and as he LEFT they promised to give him money. So, Judas waited and watched for the RIGHTtime. On the first evening of the Feast of Unleavened Bread, Jesus and His disciples met for the Passover meal. RIGHT while they were eating, Jesus told them that one of them would hand Him RIGHT over to His enemies. This LEFT the disciples in a state of sadness. When they finished their meal they LEFT to go to the Mount of Olives. Jesus told His disciples that all of them would leave Him, but Peter argued that He would stay RIGHTwith Jesus always. Jesus told Peter that RIGHT that very night, before the rooster crowed twice, He would deny Him three times. At the Garden of Gethsemane, Jesus instructed His disciples to keep watch while He LEFT to pray. Jesus fell RIGHT to the ground, praying that the hour might pass RIGHTby Him. When Jesus returned to His disciples, Judas appeared. Judas, was about to hand JesusRIGHT over to His enemies. Judas went RIGHT to Jesus and kissed Him. The men grabbed Jesus and arrested him RIGHT there. Jesus was taken RIGHT to the high priest and Peter followed. The chief priests and the whole Sanhedrin wanted to put Jesus RIGHT to death, but they could not find anything to use against Him. Many told lies about Him, but JesusLEFT all of their questioning unanswered. The high priest asked Him if He was the Christ and Jesus was LEFT to answer the only thing He truthfully could, "I am." RIGHTaway, they found him guilty of blasphemy and said he must die. At the time, Peter was RIGHT below in the courtyard. He was asked three times if He knew Jesus, but three times he denied he did. RIGHT away the rooster crowed for the second time and Peter broke RIGHT down and sobbed. Early in the morning Jesus was tied RIGHT up and handed over to Pilate. Pilate was LEFT amazed at the character of Jesus. He didn't feel RIGHT about harming Him, but the crowds shouted that they wanted Jesus put RIGHT to death. Pilate wanted to satisfy the crowd so he ordered that Jesus be whipped and nailed to a cross RIGHTaway. The soldiers LEFT with Jesus RIGHT away. They put a purple robe on Him and twisted thorns together to make a crown to put RIGHT on his head. They hit Him and spitRIGHT on Him. They made fun of Him and then forced Him to carry a cross RIGHT up Golgotha Hill. They nailed Jesus RIGHT to that cross. Then they divided up what was LEFT of His clothes, casting lots to see what each of them would get. They crucified two robbers with Jesus. One was on his RIGHT and one was on his LEFT. At noon, daylight LEFT and darkness covered the land for three hours. At three o'clock Jesus cried RIGHT out in a loud voice, My God, my God, why have you LEFT me? When Jesus took his last breath the temple curtain was torn RIGHT in two from top to bottom. As evening approached, Joseph went RIGHT to Pilate and asked that Jesus' body beLEFT for him to bury. With Pilate’s consent Joseph took the body RIGHT down from the cross and wrapped it in linen. He LEFT the body in a tomb cut out of rock. Then he rolled a large stone RIGHT against the entrance of the tomb. RIGHT on the first day of the week, Mary Magdalene, Mary the mother of James, and Salome LEFT to go to the tomb. They LEFT just after sunrise. They were going to apply spices RIGHT to Jesus' body. When they arrived they were LEFT in shock. The very large stone had been rolled RIGHT away. They entered RIGHT into the tomb and saw a young man dressed in a white robe. He was sitting on the RIGHT side. He told them not to be afraid because Jesus had risen and had already LEFT the tomb. He instructed the women to go RIGHT to Jesus’ disciples and let them know that Jesus had risen. Share the Easter story with your children in a unique way this year. Give each of them a different Easter gift or treat to pass around as you read the Right Left Easter Game Story. Start a new family tradition by making the reading of the right left Easter game story an annual event. 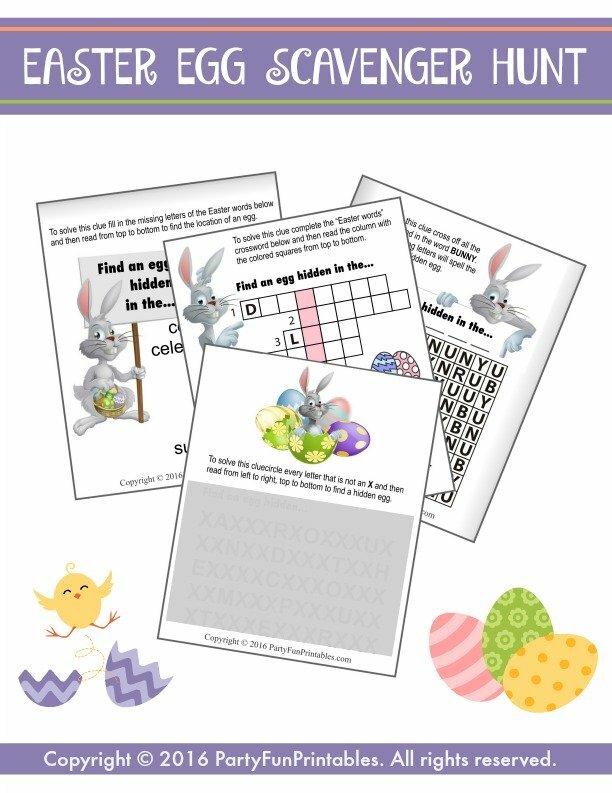 For a printable version of this Right Left Easter Game fill in the form below. 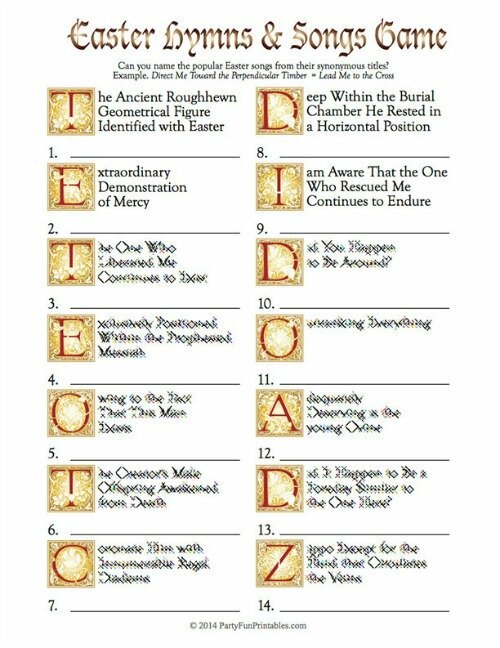 When we receive your request, you will receive immediate access to a printable copy of this Right Left Easter Game. Please remember this game is copyrighted and for personal use only. DO NOT post it online or on forums, blogs, etc. Thank You! 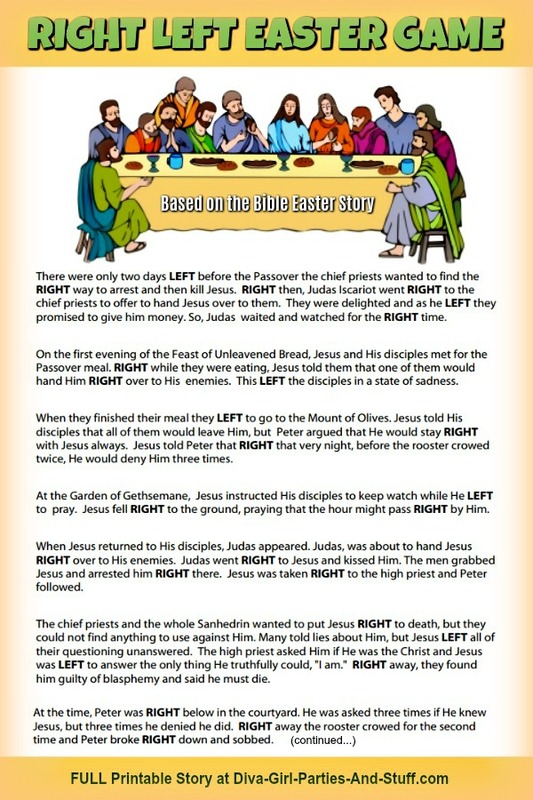 To view this printable Right Left Easter Game you will need Adobe Reader installed on your computer (the latest version is recommended). Get your free Adobe Reader here (a new window will open so you can download without leaving this page). I used this game at my Annual Easter party. I had about 30 kids at my house and this game was a good way to calm the kids down and also share the Easter story. I separated the children into two circles... boys and girls. Each child got a paper bag which contained a small gift and an egg. One of the bags contained a golden egg with $10 dollars inside. I gave the kids 2 rules. They had to be extremely quiet so they could hear the story and they could only open the bag after the story was completed. The children had a ball trying to contain their laughter as they passed the bags left and right. It was like we were in an old Baptist church as it was being read. Many of the adults started quoting along with the reader. It was a great game. It meant alot spiritually to the adults and I hope the kids learned a lesson about the real meaning of Easter... great game truly.